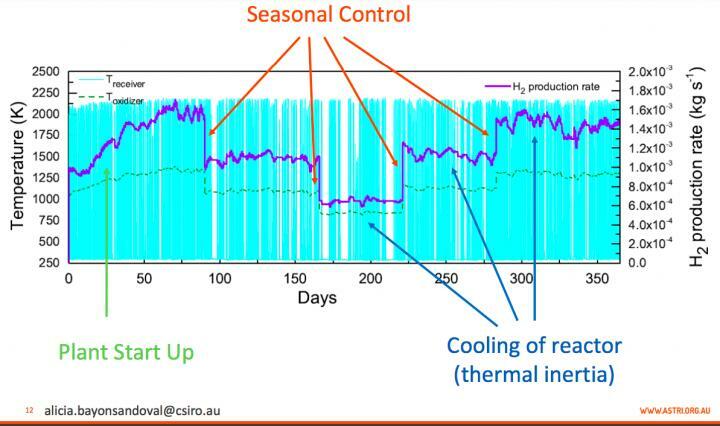 A paper, Dynamic Model of a Continuous Hydrogen Production Plant Based on CeO2 Thermochemical Cycle, presented at the SolarPACES2017 Annual Conference, proposes using ceria particles not only as the redox reactant in hydrogen production, but also for heat storage and heat transfer media (or medium) to control the temperatures. Hydrogen can be produced by splitting water (H2O into H2 and oxygen) at very high temperatures using concentrated solar thermal (CST) – avoiding today's use of fossil fuels for hydrogen production. Using mirrors reflecting focused sunlight onto a receiver, CST can generate very high temperatures for thermochemical processes in a solar reactor, up to 2,000°C, and can store solar energy thermally so it can dispatch the energy when needed.